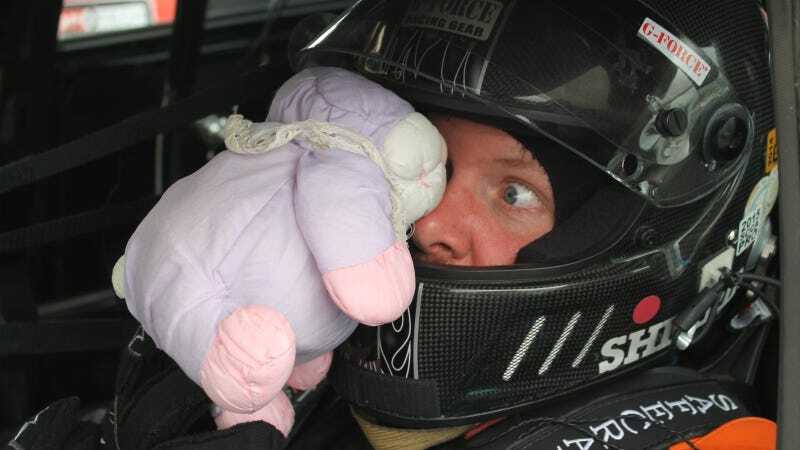 Because today is Dia del Conejito, I'm going to whip out my collection of photos of racing drivers with Easter bunnies. Thankfully, my bunnies are pretty cute. I won't give you nightmare fuel like the folks at Nascarcasm did, unless you're B-Spec Fiesta racer Marc Sherrin above. Sit back, relax and enjoy the holidays. The Puffalumps are my 24 Hours of LeMons team mascots. We're Der Porschelump, and there's a giant vinyl of Fluffy Bunny (a special edition Easter Bunny Puffalump from 1987) on the roof. Puffalumps are, without a doubt, a thing. So, enjoy this collection of racing drivers with Easter bunnies. Which Goes Further: Your Stomach Or A Modern Diesel Car? "Oh, you set the lap record?" Happy Easter, Jalopnik. May this day be filled with hugs.